Not In Texas? Select Your State! Welcome to Texas Online Defensive Driving! Why Choose Our Texas Defensive Driving Course? You can complete our TDLR-certified course 100% online around your schedule. Our course offers interactive videos and graphics which provide you with the information you need. Each chapter ends with a quiz you can't fail, since you can take it as many times as you need to get a 70% or higher. Start the traffic course today! Taking a traffic course will help keep your driving record clean. Texas operates on the Driver Responsibility Program, also called DRP, which requires you to pay a $100 "assessment surcharge" if you collect 6 points during a year. Continual violations can result in a license suspension. Keeping that in mind, note that a moving violation will add 2 points to your Texas Driver's License. If that violation resulted in an accident, it will add 3 points. Points will also increase your insurance, usually exponentially. 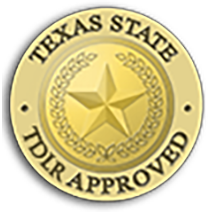 Here's the good news: taking our online Texas defensive driving course will keep points off your license. In fact, taking this course may lower your car insurance costs instead of increasing it. Only those who have not taken a defensive driving course in the past 12 months to dismiss a ticket are eligible for this option, which is considered a privilege. Those with a commercial driver's license (CDL) cannot take the course to dismiss a ticket. Certain violations (speeding over 25 mph, passing a school bus, leaving the scene of an accident, no car insurance, and construction zone violations) are also not eligible. However, if you were cited for a minor moving violation, you can take a defensive driving course for ticket dismissal, avoiding the hassle, cost, and stress of the other two methods. On top of knowing points won't be added to your license, our Texas defensive driving course could also earn you a 10% discount on your car insurance. Turn your bad experience into a positive one where you save money on your auto insurance and become a safer driver. Get a Texas Insurance Discount! Depending on your provider, you may be able to get up to a 10% discount on your insurance! Each provider will offer something different, so be sure you check with company to see how taking our course can benefit you. Plus, we will send you two copies of certificate of completion for no extra cost so you can send one to your insurance company as proof. A single ticket will increase your insurance, but you can beat the system and receive a discount instead with our online TX defensive driving course. All you need is an internet connection — our class is open on mobile devices! Each county in Texas has different laws regarding the ticket dismissal procedure. Most will require you notify the court before selecting the traffic school option. Take a look at the defensive driving requirements for your county. Start Our Defensive Driving Texas Course Now! Registration is easy! Once you create a user name and login, you will be able to access the online defensive driving course on any web-enabled device at your leisure. Our friendly customer service experts are available 24/7 to answer your online defensive driving course related questions. Contact Online Defensive Driving. Copyright ©, Online Defensive Driving - The Online Traffic School, Inc. TDLR License CP529 C1760.